Above picture - Austin & Some of his Kids, Grandkids & Great Grandkids. Austin was not our first Kerry Blue, but he was the one that we decided was the type of Kerry that we wanted as the foundation for Olizure. The type of Kerry that had real personality, an amazing show attitude, a love of people and life in general, but most of all, he was healthy as an ox. To add to this, he also had conformation that we admired and hoped to be able to contribute to Kerrys in the future ~ especially in our future - The Future of Olizure Kerry Blue Terriers. Even though Austin only produced 2 daughters for Olizure, this contribution was all that we needed. 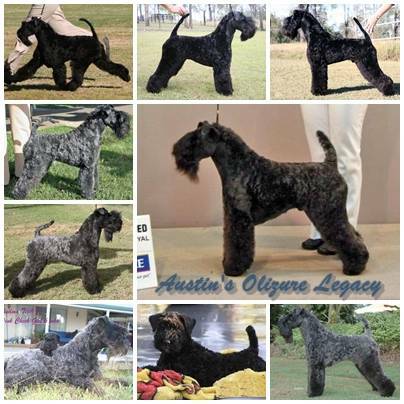 His first daughter was Teah, Australian Champion Olizure Celtic Charm (from the "Charm" litter). Even though her show career was very short due to motherly duties (in which she excelled), she was a valuable asset to our kennels. She is the mother of Guinness and KodaJo (from the "Like" litter). Guinness, Australian Grand Champion Olizure Lieka Pint, was to be our very first Olizure Grand Champion (& the youngest Grand Champion Kerry Blue in Australia) and his very successful show career speaks for itself. He had the conformation and movement of his grandfather, Austin, and that was what we were after. KodaJo, Australian Champion Olizure Lieca Diva, also had a limited, yet successful show career. With limited outings, she won Runner Up in Show at a Terrier Specialty Show and is the mother of our latest rising star "Ruffo" - Olizure Dirty Secrets. Ruffo definately has his Great Grandfather's show attitude and we really look forward to seeing what the future has instore for this little pocket rocket. Teah's next litter produced an only child, Cooper, Olizure Hot Blu Dog. Cooper is a testiment of Austin's wonderful temperment and became Olizure's first Delta Dog (see his own page on our website). Teah now lives with a lovely friend of ours on the Sunshine Coast, where she is the Doggy Hostest for "The Loft" - see our "Dog Friendly Accom." page on our website for recent pics of Teah and information on "The Loft". Austin's second daughter for us, was Ivy, Australian Champion Sacrebleu Pureprint Blu. Austin will never be gone while this girl is around. She shares her father's true love of life and wicked sense of humour. She gives the same looks of love and has her father's wonderful personality. Her show attitude was amazing, unfortunately, she didn't share Austin's love of the grooming table - and therefore, her show career was very limited. Thank goodness she is a great mother and is the mother of the "Devil" litter - one of which is our own beautiful young man Smith, BIS Australian Champion Olizure Betta ThDevil Uknow. Ivy, even though she is a small girl, can "cover ground" the way her father could, and this has been continued down to her 2 kids that are currently being shown - Smith & Maeve (Australian Champion Olizure Devil May Care). And from a repeat mating of these two beauties, we have been campaigning Jack "Olizure Hell Below Zero" & Ragen "Aust Ch Olizure Hell on High Heels" - both are also Multi Class in Show winners and have definately put a stamp on the showring. Now that Austin has gone over the rainbow bridge to run free with our past fur companions, he will never be forgoten and will live on forever in his children. Every Olizure Kerry today can be traced back to Austin. He will always be remembered for his wicked sense of humour, good looks and amazing friendship that was always on offer to all. One day, we hope to have the opportunity to have another Austin Kerry Kid grace our home as we have "Austin Puppy Potential on Ice" and we look forward to this day. Austin - Taken from us before his time, let us always remember him.